Bayonetta (birth name Cereza) is the main protagonist from the Bayonetta series developed by PlatinumGames and owned by Sega. She is an Umbra Witch, a member of an ancient clan affiliated with Inferno that practiced dark arts and was sealed away in coffins for 500 years. After being awakened in the present day, she has no memory of her past, and fights against the forces of Paradiso to remember and uncover who she really is. Bayonetta appears from Bat Within, briefly creating the symbol of Umbra magic. 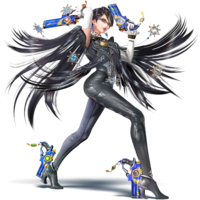 Bayonetta appears as a downloadable character in Super Smash Bros. for Nintendo 3DS and Super Smash Bros. for Wii U, chosen based on the results of the Super Smash Bros. Fighter Ballot, as the top most requested character in Europe, among the top five characters in the United States, and the most requested in the world out of all recognizable character suggestions. This makes her the second character in the Super Smash Bros. series to come from an M-rated series (the first being Solid Snake from the Metal Gear series), and the only female third-party fighter in the Super Smash Bros. series. Also, excluding the female variant of Corrin, Bayonetta is the only female DLC fighter in Super Smash Bros. for Nintendo 3DS / Wii U. She comes bundled with her own stage, Umbra Clock Tower, and is voiced by her respective voice actresses from Bayonetta: Hellena Taylor in English, and Atsuko Tanaka in Japanese. Bayonetta's play style is largely focused on combos as in her game of origin, though her moves are generally slow to start. Much like her games of origin, she uses four pistols, two in her hands and two attached to her heels, known collectively as Love is Blue. By holding down the attack button after performing a move, Bayonetta can use her Bullet Arts, in which she briefly fires each of her guns to deal more damage. The bullets do not cause flinching except at close range, can pass through characters, and cannot be reflected (such as with Reflector) or blocked with Link's shield. For her smash attacks, Bayonetta uses her Wicked Weaves, using her hair to summon the limbs of Madama Butterfly to attack. Finally, if the player dodges an attack too late (either rolling, dodging, or air dodging), she instead activates Bat Within, in which she briefly transforms into a swarm of bats to dodge, halving the amount of damage taken. Her standard special move is Bullet Climax, in which she rapidly shoots opponents with her guns. She can charge this attack and cancel it by rolling. Her side special, when used on the ground, is Heel Slide, which slides across the ground and, if the player holds the button, can end with a kick into the air. When used in the air, it is After Burner Kick, in which Bayonetta kicks through the air. By default, Bayonetta makes a diagonally upward thrust, but if the player presses down shortly before the move is performed, similar to Ryu's Hadoken input, the thrust goes downward. She can reuse after a double jump. Her up special move is Witch Twist, in which Bayonetta spins up into the air to attack, and it can be used again after a double jump. Her down special is Witch Time, a counter-like move which slows down time around opponents caught by her, drawn from her signature ability in the Bayonetta games; this also activates Bat Within if an opponent attacks her too late after activating. Her Final Smash is Infernal Climax, which starts with Witch Time surrounding the whole stage, and after a meter is filled ends with her summoning Gomorrah to chomp on opponents. Her Final Smash has similar properties to the Danger Zones on some stages; if opponents have accumulated too much damage, they are instantly KO'd. Bayonetta's taunts involve her dancing, and are the longest of any character in the series. Because of this, they can be canceled at any point. While Bayonetta's normal appearance is largely based on her design in Bayonetta 2, her design from the original Bayonetta is available as an alternate costume, which also changes some of her visual effects to match her "red" design in that game. In addition, in the Japanese release Hellena Taylor's voice clips are used when using this costume, as the original release of Bayonetta did not have Japanese voice acting. She also has an alternate coloration based on her rival turned ally Jeanne, which also changes the color of her hair when using smash attacks and her Final Smash to white. 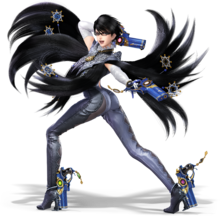 Thus, Bayonetta is one of two characters in the series to change weapons depending on the costume (using her original guns, Scarborough Fair, rather than Love is Blue for her original design), and is the only character in Super Smash Bros. for Nintendo 3DS / Wii U whose visual effects are different depending on the costume. Bayonetta can be equipped with the Suit and Boots equipment. Oddly, Bayonetta can also use the Zapper equipment, which is designed for characters who originated from NES titles, though in her case, it is most likely to reference her reliance on guns. Bayonetta reappears in Super Smash Bros. Ultimate, this time as an unlockable character. Bayonetta runs faster and her Bullet Arts can be angled during certain moves. However, her special moves have generally become weaker and slower. In Super Smash Bros. Ultimate, the sounds of her gunshots change slightly depending on the origin of her costume. In the Adventure mode, Bayonetta is seen when the fighters oppose Galeem for the first time. She attempts to dodge Galeem's beams of light, but is unsuccessful and she, like every fighter except Kirby, is hit by one of them and imprisoned in the World of Light, where a Puppet Fighter of her is created. Said Puppet Fighter initially serves Galeem, but is later brought under Dharkon's control. The Dharkon-serving Bayonetta Puppet Fighter is eventually defeated, freeing the real Bayonetta who joins Kirby's team against Galeem and Dharkon. Unlike most other routes, the Bonus Game in Bayonetta's Classic Mode route takes place between Rounds 5 and 6. Giant Charizard (white costume) Skyloft Time For The Climax! Pit ×6 Let's Hit The Climax! Bullet Climax is Bayonetta's standard special move. The move is based on one of the techniques Bayonetta can use in her games. Bayonetta fires her guns (either her handheld ones or her heel guns) at opponents, though unlike her Bullet Arts, this move deals hitstun to opponents. This move can be charged by holding down the button and can be canceled while charging by shielding or tilting the analog stick (which causes her to roll). In addition, by repeatedly tapping the button, the duration of her firing can be extended for a time. Heel Slide is a technique Bayonetta can learn in the Bayonetta games, and her side special move. Bayonetta slides across the ground in a kick attack. By holding down the special attack button for the duration of the move, Bayonetta follows up with a vertical kick that knocks opponents into the air. If used in the air, the attack is called After Burner Kick, another technique that Bayonetta can learn from the games. Bayonetta kicks diagonally up, and if it hits an opponent the move can be used a second time. If the player holds down on the control stick before performing After Burner Kick, the attack instead sends Bayonetta kicking diagonally downward. Witch Twist is Bayonetta's up special move. 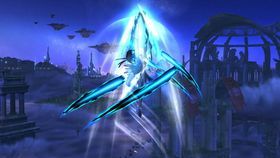 Based on the technique she can obtain in the Bayonetta games, Bayonetta spins into the air in a short distance, damaging any nearby opponents on the way up. Unlike other up special moves, Bayonetta is not rendered helpless after using this move, and it can be used a second time after using her midair jump. Witch Time is a major ability in the Bayonetta series, and is Bayonetta's down special move. When used, Bayonetta does a backflip, similar to her back roll animation, though when struck during this she activates Witch Time on that opponent, slowing their movement for several seconds; the amount of time is indicated by the clock hand that appears over them. The amount of time that Witch Time lasts depends on the opponent's damage, though multiple uses also lowers the duration of the effect. 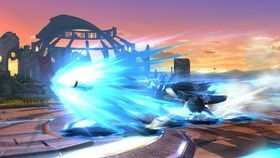 If the move is used too late before being hit, Bayonetta instead uses Bat Within, another ability from the Bayonetta series, in which she briefly turns into a swarm of bats to dodge the attack, reducing the amount of damage taken. The player can control where Bayonetta reappears by inputting on the Control Stick or Circle Pad. Bat Within is also activated if the player rolls or air dodges too late. Unlike with most counters, Witch Time is able to counter certain unblockable attacks, such as Little Mac's KO Uppercut and Guard Breaker, along with Meta Knight's Shield Piercer. The move can also affect Wario-Man in Super Smash Bros. for Nintendo 3DS / Wii U, despite the fact that he is invincible to everything except eating explosives and going off-screen. The only attacks that Witch Time cannot counter are grab attacks. 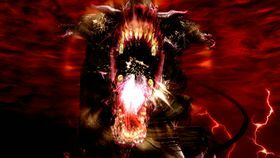 Infernal Climax is Bayonetta's Final Smash, based on the finishing moves Bayonetta uses on large enemies in the Bayonetta games. When used, Bayonetta activates Witch Time across the entire stage, while the Climax gauge appears on-screen, which fills by attacking opponents. 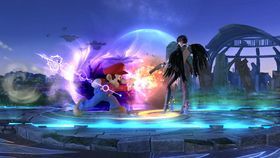 Filling the gauge entirely before Witch Time runs out transitions to the next portion of the attack, in which Bayonetta uses her Wicked Weaves to summon the Infernal Demon Gomorrah, who chomps on the opponents several times to inflict damage. The amount of damage Gomorrah deals can be increased by mashing the standard attack button, which fills another gauge. If an opponent's damage is over 100% by the time the attack ends, they are instantly KO'd. Wii U Bayonetta 2 (10/2014) Bayonetta is one of the last of the near-extinct Umbra Witches clan. She's a master of the Bullet Arts and can use her hair as a conduit to bring forth Infernal Demons. She brings all these skills and more to Smash, where she'll unleash additional damage if you hold the attack button. Damage and distract your foes with this move! Bayonetta is one of the last of the long-extinct Umbra Witches clan. She's a master of the Bullet Arts, and can use her hair as a conduit to bring forth Infernal Demons. She brings all these skills and more to Smash, where if you hold down the attack button, she'll fire bullets at the enemy. They don't just do damage; they even work as a feint! Wii U Bayonetta 2 (10/2014) If you use Bayonetta's side special in midair, she'll do a diagonal kick upward that goes through platforms. If you press down just before doing the move, it'll turn into a downward attack! Plus, if you hit an enemy in midair, you can use the attack again before you hit the ground–great for combos and recoveries! N/A N/A Before her Final Smash, Bayonetta enters Witch Time, during which she can attack the enemy to fill her magic gauge. If it fills up, she summons the demon Gomorrah, who chomps down on the unfortunate foe! Keep pressing the button during Gomorrah's attack to increase damage. If it hits 100% the enemy will be instantly KO'd! Bayonetta (01/2010) This Umbra Witch awakens after hundreds of years without any memories of her past life. Usually Bayonetta spends her days pretending to be a nun to lure out angels, until a witch with the same powers as her starts to slowly bring her memories back. She ends up embroiled in a battle to save the world. This Umbra Witch awakens after hundreds of years without any memories of her past life. She spends her days with shenanigans like dressing as a nun to lure out angels to fight, until a witch with the same powers as her starts to slowly bring her memories back. As her memories return, she ends up embroiled in a battle to save the world! Bayonetta shares this stock conversation with Mewtwo, Roy, Lucas, Ryu, Cloud, and Corrin, the game's other downloadable characters. Pit: An Umbra Witch has entered Skyworld! AHHHHH! Palutena: Bayonetta. Nemesis of angels. Slaughterer of Centurions. Wearer of questionable outfits. Pit: I wonder why Bayonetta hunts angels. Pit: Whooooo... OK. But the angels Bayonetta hunts aren't nice angels like me. They're monsters...right? Viridi: Angels can take many forms, just as goddesses can. Viridi: Take Palutena for instance... Her current appearance is something humans can comprehend, but it's not her true form. Palutena: You're one to talk, Viridi. Viridi and Palutena: Hahahaha! Hahahaha! Viridi: Ugh. If you get caught in one of her combos, just...like...wiggle around or something. Beyonetta Transliteration of her English name. Beyoneta Transliteration of her English name. Bayonetta with her Peach costume fist-bumping her Bowser summon during a cutscene. She could don outfits based upon Peach's and Daisy's signature dresses, with Mario and Luigi dolls attached respectively, which give her the ability to summon Bowser for Wicked Weave attacks (although only his limbs were shown; Bowser's voice can also be heard) and cause defeated enemies to drop coins rather than halos. In Bayonetta 2, she could wield a Chain Chomp as a weapon and don Mario's hat (albeit with a "B" instead of Mario's "M") when using an Umbran Elegance with the Chain Chomp, even saying, "Mama-mia!" when taunting. Her friend Jeanne could also wield the Chain Chomp, but instead gains Luigi's hat (with a "J" instead of an "L"). For her forward throw, Bayonetta uses the Tetsuzanko (Akira Yuki's signature move). While performing it, there is a chance she will say his catch phrase "Jū'nen hayai'n da yo!" ("You are ten years too early!"). This page was last edited on February 9, 2019, at 10:39.